Tchogha Zanbil is the ruins of the holy city of the Kingdom of Elam, centered on a great ziggurat and surrounded by three huge concentric walls. 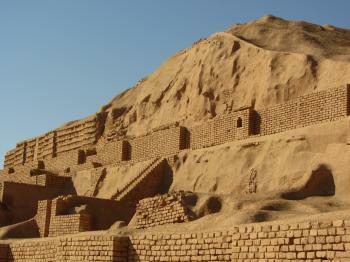 Founded around 1250 BC, the city remained unfinished after it was invaded by Ashurbanipal in 640 BC. 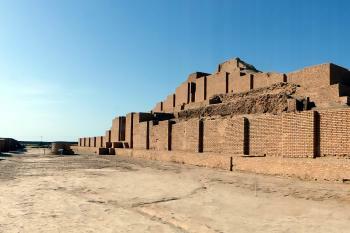 Archaeological excavations between 1951 and 1962 revealed the site again, and the ziggurat is considered to be the best preserved example in the world. It is one of the few extant ziggurats outside of Mesopotamia. It was built about 1250 BCE by the king Untash-Napirisha, mainly to honour the great god Inshushinak. The complex is protected by three concentric walls, which form three main areas of the "town." The inner area is wholly taken up with a great ziggurat dedicated to the main god, which was built over an earlier square temple with storage rooms also built by Untash-Napirisha. I visited Tchogha Zanbil (as well as the other nearby WHS) on a long day trip from Ahwaz, between two overnight bus trips. This is not a recommended way to see these sites, as you can find yourself at the whims of an unpleasant driver who decides to double the price of the trip halfway through. While I showed this driver (the only one at the station willing to take the trip) my map showing a route of Ahwaz-Susa-Tchoga Zanbil-Shushtar-Ahwaz, he nevertheless insisted on going to the ziggurat first, expressly denying the existence of a clearly-marked road linking them east-west. This caused pointless doubling back, which he repeatedly passive-aggressively blamed on me. Approaching the ziggurat, I was amused by signs prohibiting the use of firearms. This instruction seemed a lot less comical when I arrived at the site to find nobody else there, with what could only be the sound of automatic gunfire in the middle distance. Combined with what seemed to be angry yelling, the eeriness of this experience soured my visit, as I didn't feel super comfortable being there in such a situation. I'm sure in reality it was perfectly fine, and once back in the car I felt a bit silly for worrying, but I nevertheless couldn't shake an uncomfortable feeling. As such, I didn't really do much more than a quick circumnavigation of the ruins, which is a shame. I note that Tchogha Zanbil’s (TZ) only previous review on this site relates to a visit as far back as 1999! So, an update from our visit in Apr 2016 seems worth providing! The 50kms drive from Susa along minor roads took around 50 minutes (Nb, if, as we were, you are trying to visit all 3 WHS on 1 trip it will take around another 45 minutes to drive the 45 kms on to Shushtar). This included a short stop to look at the ruins of Haft Tepeh which are situated around half way. This is another Elamite archaeological site of temples and a (probable?) ziggurat which pre-dates Tchogha, from a time when the Elamites were disunited - whereas TZ is the product of Elam at its pinnacle. The ruins are by the road side and can be quickly seen “for free” – if you are passing, it is certainly worth such a viewing, if only to add to your “Ziggurat count” (there are said to be only 35 in the World with 28 in Iraq and 5 in Iran – we also visited the ones at Susa and Sialk Tepe but missed the one at Jiroft!). The site has a small museum in a new building (Apparently the previous one was badly damaged during the Iran-Iraq war), which Lonely Planet says is “a good primer for Choqa Zanbil” - but we were short of time and gave it a miss. In fact, the building’s prime role is as the “Research Centre” for the jointly managed sites of TZ and Haft Tepe. TZ itself doesn’t have a museum and, I suspect, most of any “finds” which could be put in one are either overseas or in the Tehran National Museum (which we did see and should certainly be visited if you are going on to the Elamite and Achaemenid sites of Iran!). This route takes you through a huge area of sugar cane fields (the main refinery is actually at Haft Tepe). All this “cultivation” hides the fact that this region of Iran is undergoing an ecological disaster from multiple causes - of which these decaying and uneconomic cane fields are but one! The current UNESCO web site entry for TZ refers to “sugar cane cultivation and processing, which have altered traditional land use and increased air and water pollution”. See - this article. The mound of TZ can be seen from some distance away, situated on low hills in semi-desert. 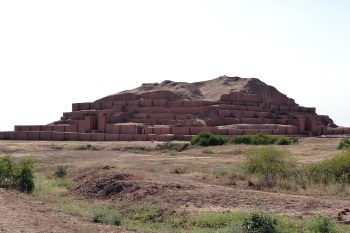 Before planning the trip, I hadn’t realised that the iconic Ziggurat is only a “small” part of the site which consists of the “Capital City” of the Elamite king Untash-Naparisha (1260-1235BC). This represented his attempt to create a new royal and ceremonial city, consisting mainly of palaces and religious structures, away from the historic Elamite centre at Susa. It is interesting to note that, at a similar time (In his case c1335BC), the Egyptian Pharaoh Akhenaten attempted a similar thing at Tel el Armana (Akhetaton) whilst, around 1240BC, the Assyrian King set up a religious centre away from his traditional capital at Ashur. In all 3 cases their new cities were abandoned after their deaths! TZ consists of a “city” area within a 2km x 2km outer wall within which were (at least, but this area was probably never completed) a few Palaces and possibly some royal tombs. There was then a “middle” wall, within which were a series of Temples to lesser gods and, finally, an inner wall within which was the main temple itself in the form of a Ziggurat dedicated to the 2 main Elamite gods – Inshushnik and Naparisha. Unlike Egytpian pyramids, Ziggurats did not contain “tombs”. There are, I guess, 2 main ways of seeing TZ - by concentrating, as we did, just on the iconic central Ziggurat within its “Inner” wall or by extending the visit to the much larger areas around it. Now, it was very hot, we had little time and the structures we did stop at on the way in (the car park is in the “outer” area) didn’t encourage us to explore further! They consisted of a few brick reconstructed walls less than a metre high forming the rectangle of a “room”. A notice board would state that this was the e.g “Temple of Pinkir” and was followed by another similar set of walls described as the e.g “Temple of Adad and Shala” etc etc! Wiki (but not the Notice Baords!) tells me that Adad was the Mesopotamian Storm God, whilst Shala was the Goddess of Grain etc - but these aren’t Egyptian temples with “meaningful” remains – just a series of low walls with nothing present to differentiate one temple from another! As you approach the massive restored brick walls of the central Ziggurat it is perhaps worth remembering that this site was discovered only in 1935 from aerial photos taken during oil exploration and that serious excavation didn’t commence until 1951. I have been unable to find a photo of what it looked like pre-restoration but one can imagine that, for it to have remained unrecognised for so long as a “Ziggurat”, the mound’s profile when first discovered must have been very different from its current appearance! (photo). Indeed its name (which has become attached to the entire site) means “basket mound” - describing its pre-excavation shape. It would appear that the Elamites called the city Dar Untash-Napirisha after the king who founded it. This reconstruction doesn’t, however, reach the levels “imposed” upon Ur and Babylon by Saddam Hussein and is probably justifiable for conservation, as much as for “presentation”, reasons since the excavation would have opened up the remains to erosion. a. The 4 main stairways, of which only 1 ever reached the highest 5th terrace - but none of which are accessible for climbing nowadays!! c.	Bricks with “inscribed” (not “stamped”) cuneiform inscriptions in Elamite. Around 5000 of these have been discovered and it is perhaps a bit surprising to see many of them left (or rather “placed”) in the walls rather than being replaced with replicas, whilst the originals are moved to “safer” locations. I found these to be the most interesting “detail” - “May the curse of the holy area of Inshushinak, Napirisha and Kiririsha befall on the person who destroys harms or relocates (this temple) and may his descendents be removed under the sun”!! The main excavations were carried out by the French archaeologist Roman Ghirshman across a period of 10+ years and he was the source of the standard views on what the site was, and why/how/when it was constructed etc. This learned article from 2014 sets these out and also attempts some revisions and might be of interest to some! It also addresses the issue raised by the previous reviewer as to why a 55km canal to bring in water was necessary. A few words on the condition of the site as this is significantly connected to its status as a WHS and to UNESCO. It has faced many problems since its inscription in 1979. There is no Nomination file available which describes the site then, and the AB evaluation is a “joke” (less than a page in length (in French only), merely describing what TZ is and with no “recommendation” at all!! ), but even it felt it necessary to mention “Bien que la ziggourat fasse l’objet de restaurations periodiques, Ie probleme de la conservation de la brique crue se pose pour l' ensemble du site de T-Z, soumis regulierement a de fortes chutes de pluie”. To this, add the ecological issues referred to above, the general problems of preserving mud buildings, the complete lack of maintenance during the Iran-Iraq war (1980-88. Iraq’s main objective was to annex Khuzestan province within which TZ is situated and a main front was nearby) and TZ would seem to have been ripe for “danger listing” – but this was never needed. By 1995, the need for major conservation action had been recognised and TZ became the beneficiary of a technical collaboration agreement with Japan, brokered by UNESCO. Well – as of 2016, there is still no souvenir shop, let alone a restaurant!!! Indeed, the ticket office is a tatty portacabin. But who really needs such things? Far more important is what has happened to the preservation and presentation of the actual structure and that seems to have been a UNESCO success story! Some visitors might feel that some of the restoration has been a bit over enthusiastic, with large areas of obviously new brickwork on the lower parts of the structure, a process which was being continued, at a fairly gentle pace, when I was there. I was surprised to find that I was allowed to climb all over the Ziggurat which stands on a low plinth measuring 105m on each side. There are the remains of a number of other structures including a large surrounding wall and others which were once royal palaces. I was particularly impressed by a water supply and drainage system which brought water from a site 40kms away (though why this was thought necessary given that we are on the tree lined banks of the river Dez here I was not able to establish). After about two hours contentedly ambling around the site, at which I was the only visitor, I'd seen enough and so took my taxi back to Shush. This remains the only ziggurat I have seen. I don't expect to see a more impressive one. Unfinished constructions: The whole city remained unfinished after it was invaded by Ashurbanipal in 640 BC, as shown by the thousands of unused bricks left at the site. It was unlikely that many people ever lived there. Petrosomatoglyphs: There is apparently a 3,000 year old footprint of a child at the foot of the Ziggurat. Cremation: "A building on the grounds contains five vaulted underground tombs, within four of which are cremated remains, and there is one uncremated corpse. The Elamites traditionally buried their dead, and the reason for the cremation is unknown." Discovered from the Air: "It was sighted in 1935 by prospectors of the Anglo Iranian Oil Company who were surveying the region by airplane"